ST made three house moves in four years, the most recent being two months before we began working together. She works full-time and runs a nonprofit in her spare time. It was bad enough that I had moved twice in rapid succession; on top of that the nonprofit’s and my personal papers were completely out of order, and the boxes were just dumped in the basement office when I moved in. I like being organized, and my anxiety level was sky high because I couldn’t find papers that I needed. I literally couldn’t move in the office and felt paralyzed. I knew I had to do something, but I had no idea where to start. I reached out to Ellia. Because of her varied work experience, Ellia understood immediately how my papers needed to be categorized. What she suggested for sorting and filing made perfect sense. She kept me focused on the task at hand because it was easy for me to get distracted by looking at individual papers. I appreciate what Ellia shares about organizing principles, and her coaching has been long-lasting! It’s also helping me figure out systems that will work for me in this new space. Throughout the time we’ve worked together, I’ve appreciated Ellia checking in to see how I’ve been doing. At the end of this package of sessions, she helped me figure out my next steps so I can keep going. I will be scheduling more sessions with Ellia because there’s still much that needs to be sorted and organized, but in the meantime I have her notes to keep me going. My ultimate goal is to make things easier when doing my nonprofit work, as well as for keeping on top of personal papers, and I feel confident that I will get there! CP was in the process of updating her home, while also working on her business there full-time. With the remodel, everything was in a jumble and I felt stuck. My office needed to be set up so I could find papers and work more efficiently. The suggestions that Ellia made for moving furniture completely changed things, and now that room is a delight to be in! We organized my bedroom closet and dresser and made some small changes with furniture, and that room now feels like a sanctuary. The guest room still needs a lot of work, but it looks better already! I have a closet that I wanted to convert to a linen closet, but I didn’t know where to begin. Ellia took time to find out what I wanted in the closet, researched options for shelving and storage items and liaised on my behalf with the company I was buying the system from. That was a huge weight off my shoulders. Working with Ellia has made such a difference – after the first session, I couldn’t believe how much more at peace I felt! Now that we’ve got through the heavy work in a handful of onsite sessions and I have a better idea of what I’m doing, we’re switching to virtual, video call sessions. I’m not ready to let go of Ellia yet! CM is a senior level project manager at an international retail company. She’s a self-confessed “lifelong learner” and keeps an eye out for ways to work more efficiently and better manage her personal projects. “I’m a project manager by trade, and consider myself to be incredibly organized, but I wanted someone to take that strength and help me apply it to prioritizing and delivering on my personal goals as well. This is where Ellia took my potential to the next level. Our package of virtual sessions allowed me to accommodate my work schedule. SH is an early-career academic physician. She contacted me for advice on how to organize her time in order to complete daily responsibilities and large projects on schedule and with less stress. “Working with Ellia has enabled me to improve my ability to organize and prioritize my work tasks. Our series of sessions have been easy to fit into my schedule and Ellia’s been flexible about tailoring the sessions to my needs and interests. “To be successful at my job, I need to be a strong self-manager. Ellia has helped me identify and then alter habits that weighed down my efficiency. Together we were also able to recognize my successes and the critical components that led to those successes, so that I could continue to use those methods moving forward. I feel more capable of producing good work, managing multiple projects at one time, and completing tasks in a less hurried and stressed manner. BL is a busy self-employed professional and an active musician. He has a music corner in his home, but it was not providing him with the space he needed to practice and study music. 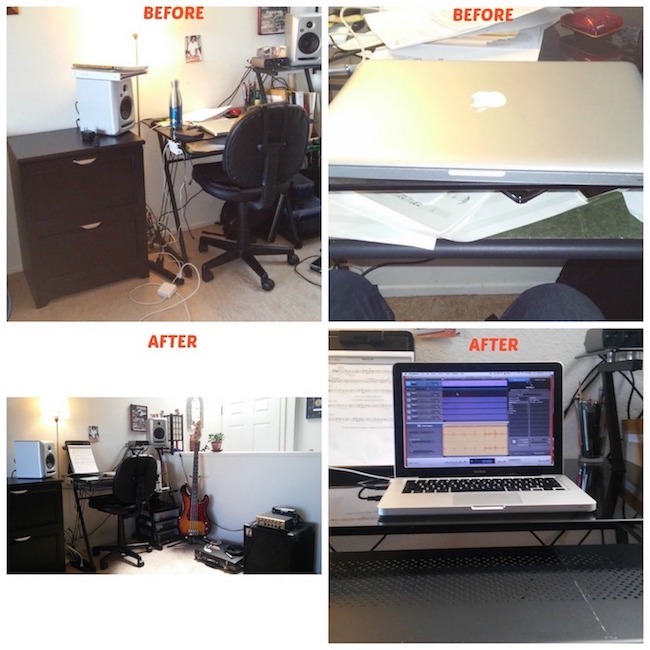 In just one virtual organizing session, he got the solutions he needed to make the space work better for him. “Ellia, thank you for helping me sort out my music corner during our virtual organizing session. Organizing has always been an effort for me, but after our first session I’m now thinking about organizing in a more efficient way. “With your help, I got rid of things I didn’t realize I didn’t need – talking about things as I was going through drawers really helped me make those decisions. And now I have places for all that “stuff” that was just sitting around before. MB has a small annex at the back of her kitchen that serves as a mud room and extended storage area for the kitchen. Using FaceTime, we worked through a virtual organizing session to remove unused items and re-organize the rest. Full-time doesn’t even begin to describe MV’s busy schedule. A busy financial services professional, MV’s guest room was no longer able to serve its purpose. “Ellia, I can’t thank you enough for helping me sort out my guest room, which is also my dressing room. I had ignored that room for too long, to the point that there was no way it could be used as a guest room and it was having an impact on our social life. You helped me realize that there were many items I was holding onto that I wasn’t using now and probably wouldn’t use in the future; it was much easier to part with those items than I thought. And, oh, the treasures I found! “You also helped me understand what causes clutter. I loved that you took the time to get to know me and what motivates me, and to coach me on how to learn new habits and routines that keep me organized. “We had the room painted, and now it’s my sanctuary – I come home at the end of the day, put my things away, and read… it’s the perfect way to unwind. JM was gifted an organizing session for his home office. KB wanted someone to create an organizational plan for her paperwork, which she accumulated through several back-to-back house moves, and a really inconvenient injury. SG is a full-time home-based PA, with two children who are with her during some of her work hours. She had a cramped office area, a desk in her bedroom to use when the kids were home, and concerns about her ability to be as effective in her job as she could be. “Ellia is my new go-to organizing expert for everything from finding creative solutions for my limited space to providing effective tools for organizing my work space and work flow issues. Implementing the task tracker has been hugely impactful in regard to how I organize my daily and weekly tasks. “Ellia was always punctual and professional and worked with a warm smile that put me at ease even when surrounded by clutter and chaos. I am still in awe over how much we accomplished in just 3 sessions and it was extremely helpful that she offered a Saturday due to my busy work schedule. KD is a busy self-employed professional, and has a keen interest in art and craftmaking. Her small office space was getting out of hand. “After just one session with Ellia, she made me think about THINGS in a different way. Working with Ellia rewired my brain to think about not only how items fit into a space, but also in terms of when they are used and their importance in the grand scheme of things. For example, that box of greeting cards sitting front and center but only accessed once a month (or less) doesn’t really need to be front and center. We replaced this with reference materials for work that do need to be there. “I’ve noticed that by moving my to-do lists away from the wall in front of me, I’m able to better to focus on the task at hand, rather than constantly looking at the million other things I should also be working on. That feels amazing. AW is a working mom with two young kids. 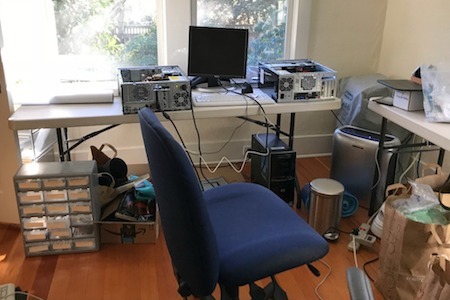 She was worried that she was getting less organized over time, which was being reflected in the state of her bedroom closet, home office and storage cupboards. She also wanted to be a good organizing role model for her kids, at an age where they are impressionable. “Ellia is a calm and tranquil organizing angel sent to deliver you from the pain of confronting your cluttered closets and spaces all alone. Her approach of teaching simple organizing principles along with helping you with the specific process of clearing your space means that you have assistance in the present, with tools to maintain your space into the future. After our sessions I felt energized, more confident and inspired, and found the effects spilling over to the days and weeks afterwards, whereby I would find myself spontaneously cleaning out a forgotten drawer or bookshelf. SS and her boyfriend needed to consolidate two large households when they moved in together, including an extensive art collection. She asked for advice on how they should negotiate what to keep, and guidance on purging and organizing clothes and kitchenware. “When my boyfriend and I decided to move in together, we didn’t realize how big a task it would be – both of us had lived independently for a number of years. We both needed to pare down, but we were so overwhelmed by the task that it was difficult to know where to start. Ellia helped me sort through my clothes and showed me how to organize my closet and drawers so I could easily see them. She suggested a better layout for my office. We were able to reduce our cookware and kitchenware, and we now have space in the kitchen for what we use every day. PH was a bachelor for many years. Then he met that special person and they decided she would move in with him. Suddenly his 730 sq ft condo looked very small and overwhelmed with possessions.